Weiss made a good point. Bob Baer said something about how the FBI and other government agencies will have to be given more access and leeway to track possible terrorist activitiy--I wonder how the uptick in terrorism is going to affect the current restrictions on how the NSA collects information. POSSIBLY PUT TO DEATH. WHEN HE SIGNED ON TO INTELLIGENCE HE KNEW AHEAD OF TIME WHAT THE JOB ENTAILED. 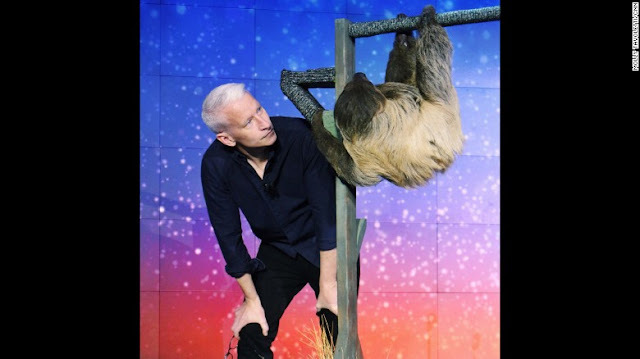 A PIX OF AC WAS IN PEOPLE MAGAZINE HOLDING A SLOTH. SLOTHS ARE KNOWN TO HANG UPSIDE. TIME SINCE THE 1920'S. YES, THE NY DAILY NEWS DID GOOD YESTERDAY AND PUT THEM TO SHAME. NOW LET'S GO TO THE SOURCE, SHALL WE. WELL OUR PRESIDENT SAID NOT ONE THING ABOUT GUN CONTROL. NICE. EXPECT MASS SHOOTINGS TO CONTINUE....WHAT HE GAVE US IS NOT A PLAN AND NO I DO NOT FEEL MORE CONFIDENT...ESPECIALLY WHEN I HAVE TO TAKE PUBLIC TRANSPORTATION TOMORROW.